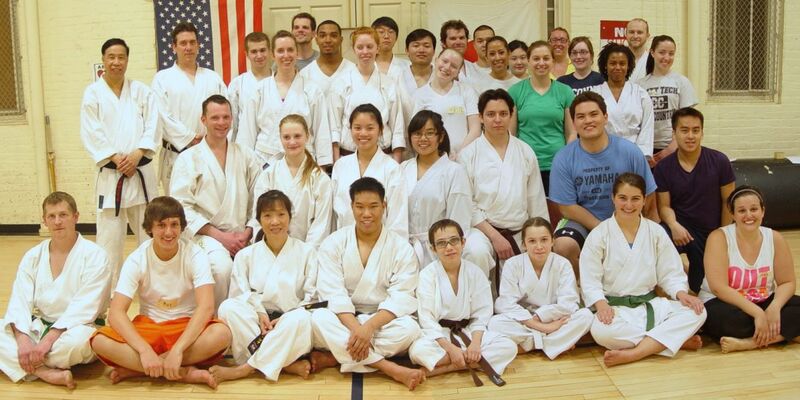 UConn Karate Club class photo, March, 2012. Front row: Pete Dunnack, Max Pianka, Kim Bui, Jeremy Bui, Liam Boyce, Sarah Boyce, Rachel Fairchild, Anna Giannattasio. Second row: Ryan Jacobs, Alex Jacobs, Lynn Nguyen, Xinyi Yi, Rudy Cepeda, John Levasseur, Thien Tran. Standing: Chinh Bui, Brian Boyce, Tom Costello, Victoria Eisenhauer, Charlie Kniffin, Daniel Eke, Tarah Eisenhauer, ?, Sokheang Chay, Kate Richman, Chris Hawxhurst, ?, Maria Montalvo, ?, Tracy Samia, ?, Becky Zajac, April Lewis, Mike Jacobs, Neysa Vishinsky. Front row: Anna Giannattasio, Ryan Jacobs, Alex Jacobs, Jeremy Bui, Liam Boyce, Sarah Boyce, Athena Tao, Marilyn Dougan. Second row: Robert Terlikowski, Keila Garrido, Rudy Cepeda, Lynn Nguyen, Sokheang Chay, ?, ?. Back row standing: Nick McIntosh, Brian Boyce, Brianna Boyce, Mark Rollins, Melissa Jacobs, Tony Carpanzano, Mike Jacobs, Rob Terlikowski, Joe Dowden, Nicole Depowski, Aidan Boyce, Charlie Kniffin, Ashley Norris, Gio Miranda, Trevor Small, ?, Sean May, ?, Junior, Bob Jacobs.